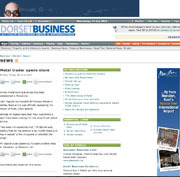 The Dorset Gold Company will pay you for any item containing precious metal. Whether broken, bent, dented, scrap, or simply unwanted, your items have actual cash value. Visit us in store or contact us and we will come to you. We can make you a no obligation offer for your gold and scrap metal. We also provide a buy back option where you can get cash for jewellery, if you have any jewellery that you no longer require call in for a evaluation and you can get instant cash. We will make you a cash offer based on the value of gold and silver on the day. You will then have the option to purchase the item back within 28 days minus the service fee. Mayor of Poole, Chris Bulteel officially opened The Dorset Gold Company in June 2010..